The Hounji Temple grounds used to have a pond in the garden located to the south of Hokoin erected by Dajodaijin (supreme minister) Fujiwara no Kaneie in 991. After Hokoin burned down, the place went to ruin and became a forest. The Onin War broke out in 1467, and this place became a battlefield. In Kyoto, society became unsettled, and people feared the demons appearing in this place. In 1567, the holy priest Genrenja Nenyo calmed the demons and built a hermitage in this place for people with disturbed minds, which was the start of Hounji Temple. Later, the holy priest prayed to Amitabha every day for the salvation of lost souls and relief of the people. In 1604, the holy priest died during the restoration of Hounji Temple. In 1616, the second Honrenja Genyo, a holy priest, erected Hounji Temple. Since then, the name of the temple was changed from Shimizu-an and officially called Shimizusan Senshinin Hounji Temple. After that, Kawaramachi Dori (street) was improved and maintained, and the town flourished. This place is called Shimizucho, which originated from the sango (title) of Hounji Temple. In 1788, the temple burned down in a great fire. In addition, a priest found and enshrined the Kikuno spiritual stone in the precincts. The stone escaped the great fire of 1864 and has been preserved to today. The main hall enshrining the statue of Amida Nyorai as the principle deity was rebuilt in 1818. The Chinese character “water” is written on a roof tile. 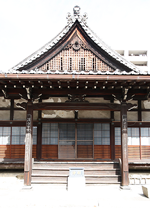 This was the residence of Kanpaku Dajo-daijin (supreme minister and chancellor) Fujiwara no Kaneie, Nijodai. After Kaneie became a priest, Hokoin Temple was built on the site of his residence. The temple was rebuilt several times. During the Kamakura period, Hokoin Temple was closed. The holy priest Genrenja Nenyo built a hermitage in this place with a spring, which was the beginning of Hounji Temple. The holy priest Honrenja Genyo erected a hall. The hall burned down in the great Tenmei fire. Rebuilt by the holy priest Kairenja Kenyo. After a coup on August 18, Kusaka Genzui (1840–1864), a feudal retainer of the Choshu domain, was confined in this temple. Restoration of the hall of Kikuno Daimyoujin. Copyright (C) Hounji Temple All Right Reserved.